New: Get alerts when you are near a Jasper Pay location. 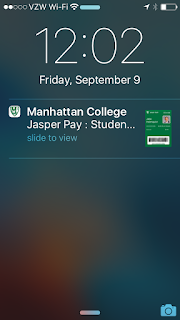 The Glance MC app now features location-based notifications when you are near College venues that accept Jasper Pay. Using beacon technology, your IOS device can alert you on the lock screen when you are near to a location that accepts Jasper Pay with a simple notification. 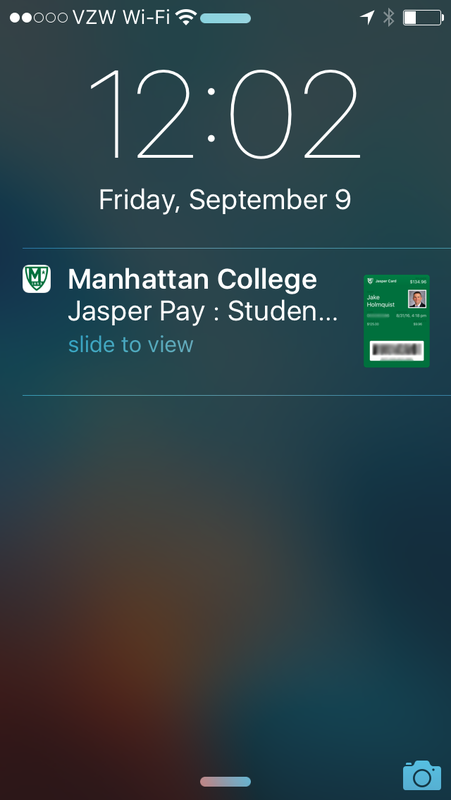 Swiping the notification activates your Digital Jasper Card for 1-click access to Jasper Pay. To use Jasper Pay, download and install the Glance MC app from the Apple App Store by searching "Glance MC". Currently, all on-campus dining venues accept Jasper Pay for both Dining Dollars and Jasper Dollars. An Android version of Glance MC is coming soon!